Smart Allergy Friendly Education: DAVID Sunflower Kernels - Loving this PEANUT/TREE NUT FREE snack! DAVID Sunflower Kernels - Loving this PEANUT/TREE NUT FREE snack! Sunflower seeds. Who doesn't love them?! Finding them with no worries of peanut/tree-nut cross-contamination is another story! I have only been able to find some at Trader Joes which we can eat safely. Of course, there is NOT a Trader Joes here in Boise. I have extended family fly them in when visiting from Philadephia or Phoenix. Until now, that is! These roasted and salted sunflower kernels are delicious and safe for our peanut-free and tree-nut free family members. 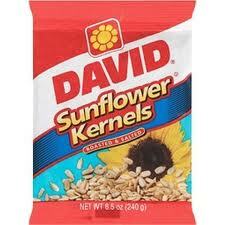 DAVID Sunflower Kernels, distributed by ConAgra Foods, Inc., Omaha, NE 68103-0768. Ingredients include: SUNFLOWER KERNELS, PARTIALLY HYDROGENATED SOYBEAN OIL, SALT. They've also got Pumpkin Seeds and a variety of Sunflower Seeds. Be sure to check out their website for more information. These are fabulous for spicing up a homemade trail mix, throwing on top of your ice cream sundae or just eating them alone. Here's a huge 'thank you' to Kelli, one of our many allergy conscious friends, for introducing us to this brand!